I thought I'd done this one before... and I had, but it was lost with a number of other things many, many moons ago. That being said, this was one of the things that someone asked me for recently (and by recently, I mean this year). With your piece of cardstock, you start by trimming it down to a general size you're going to use. 1. Along the belt area on your model ti fit in snug. 2. The sides to get the shape you want. 3. The bottom either straight or ragged (depending on your preference). Keep in mind, it's only cardstock so you can keep cutting new pieces and trying new shapes and such until you get what you want. You don't have to worry about losing any really money on this part of the process. I've even used regular paper at first until I could get the shape I wanted and then transferred that over to the cardstock. With most waists being curved, you'll need to add some bend to the cardstock so that it fits in nicely with the model. With your final shape cut out of cardstock and bent to fit the model perfectly, you're ready to move on. 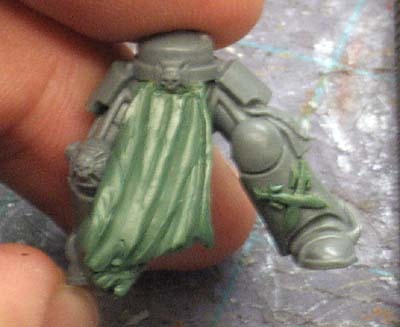 In this case, I gave the tabard a ragged bottom and curved it to the right of the model in order to match his cape. 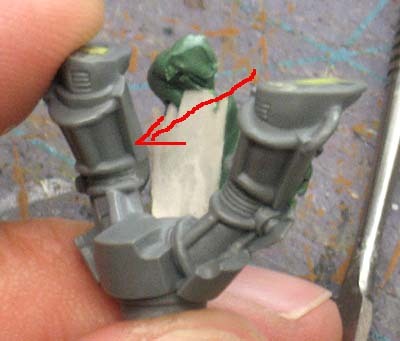 To attach you tabard "base" to your model, just superglue it in place. The reason you use the runny kind and not the thick kind of superglue is because you want the cardstock to wick the glue into it. After you attach your piece to your model, go in and cover your entire piece of cardstock with the superglue. A light coat is all you need, you just want the cardstock to be completely covered in superglue. Too much and you'll have an uneven surface (not the biggest problem, but sloppy) and too little means areas of cardstock unprotected (big problem). Coating the cardstock with superglue basically turns it into plasticard. It also protects the "paper" from the water and moisture in the greenstuff when you go to apply it on top. This whole process creates a plastic like structure for you to work with your greenstuff on top of. 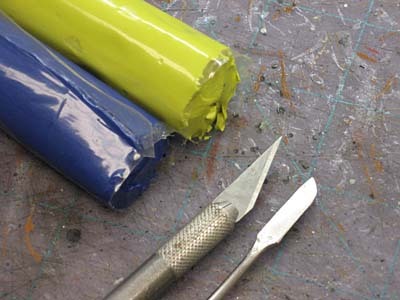 It provides a strong backing and a template for you to follow when you're sculpting. You'll want enough greenstuff to cover your cardstock and have a depth of about 1/8 inch or 3 to 5mm (depending which side of the pond you're on). Your "plasticard" cardstock should be more than solid enough to support you working on it, but if you find it wanting to bend, all you need to do is support the back of it with your finger while sculpting (this is why we left him unassembled). 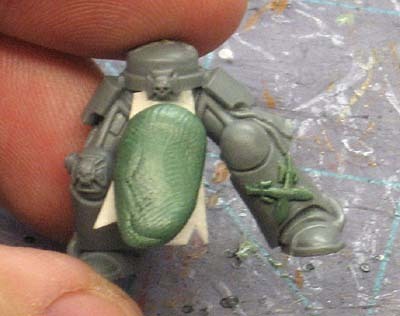 Start off by pushing the greenstuff up to the belt area and then pulling it down to towards the bottom of the tabard. 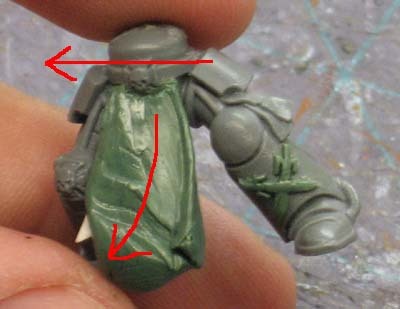 You're looking to get a smooth and consistent thickness of greenstuff over the surface of your entire tabard. I usually use the flat end of the GW sculpting tool for this part of the process. Now for the folds. I usually start in the upper right corner and work right to left and top to bottom. It's just the way I've found that works best for me. I will say that you could start on either side, but you'll need to work from top down to bottom so you can pull the greenstuff as needed to create the folds where you want them. Here's where I use a combination of the blade end of the GW tool along with the edge of the flat end. I use the blade to cut the recessed portion of the fold and then the edge of the flat end to spread it apart along each side going downward. I continue making folds and working them into the position I want as I go across the surface of the tabard. Remember to follow the flow you created with your template and most important of all, make sure you add some variety in the folds. If they are all the same thickness, width and distance apart, it will not look real... it will look too "perfect" and you won't have the illusion of real cloth hanging there. 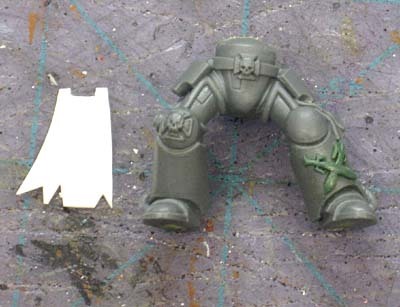 As you work, you'll end up dragging some of the greenstuff past the bottom of your template. This is where the X-Acto blade comes in. 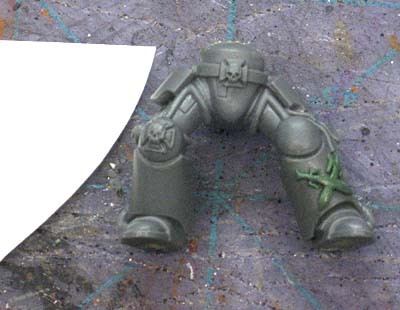 You cut away any overhanging excess by using the blade and pulling towards the back of the model (the direction of the red arrow). If you pull in another direction, you risk destroying your work on the front of the tabard. You also need to have a sharp blade that is wet so you don't move the greenstuff any more than necessary. Any fixing can be done by flipping the model back over and tidying up the bottom edge on the front when you're done cutting away the extra. From this point on, it's a matter of working in your folds and cutting away any excess from the bottom. 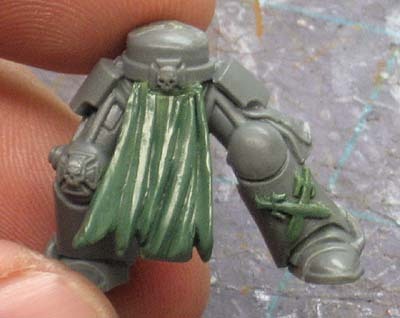 It won't take long before you've covered the front of your tabard with folds. And you don't need a hundred folds either, sometimes it just takes two or three to get the desired effect. I added a few more than normal on this one since I trying to match the look of his cape (the plastic war-torn Chaos Terminator Lord cape). As a final touch (and this is completely optional), I added some "damage" to his tabard to make it match the cape. By using the tip of the GW tool blade, I pressed it into the greenstuff and pulled slightly downward to make little holes in the material. If you're doing a new or undamaged tabard, this part is not needed at all. So you can see that you can get a variety of looks and folds. 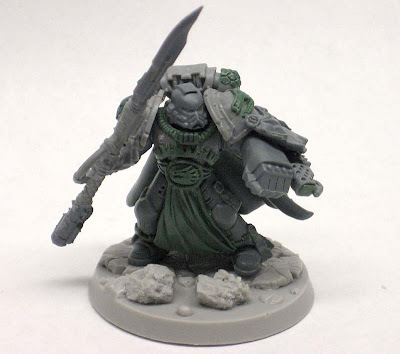 In the cases where it's just one model, you always have the option of going with a plastic tabard "bit" just so long as it fits in with your pose and model. This technique can get quick results and give you the ability to make what you want without having to rely on bits. Very helpful Ron thanks for that. And some pictures of cool and interesting models to boot! 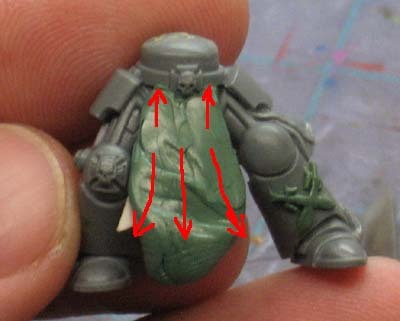 You know, that's so simple that I feel like an idiot for not even considering using plasticard as a base for a tabard. I've always done it the hard way. Great article! Another great (and practical) tutorial, thank you. No problem guys, glad it helps. I've got some other ones that are as simple I'm working on as well. - One question though. Do you let your greenstuff cure any before working on it? Do you find the need to go back and smooth it with sandpaper/files towards the end? The answer appears no from the tutorial, but those were some questions I had. DrGabe: I do not. I mix it rougly 50/50 and once it's mixed, I get to work. I don't generally go back and sand or cut away anything after sculpting. If I do, it's to fix a small mistake or clean something up I missed originally... or it's because I needed to wait until it was cured before I could work it (for example the Dark Eldar shoulderpads I did a while ago). Those are rare though since I try to keep away from those kinds of sculpts. Awesome tutorial, I will definitely try this one! Thanks heaps for the tutorial - I've been desperately awaiting it! I'll go and put my new fond knowledge to work and sculpt some cloaks! Great tutorial, man, thank you! Wow, what a great tutorial. 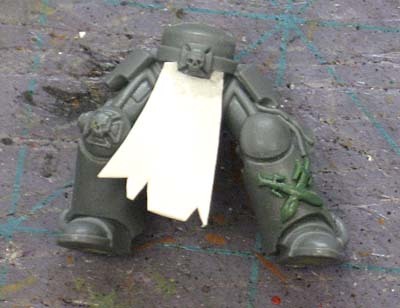 I've often stuggled with trying to sculpt cloth capes, robes and the like because I couldn't get the green stuff supported. Using the cardstock/superglue trick looks brilliant. Cant' wait to try it out. Good tutorial. Any chance there are more pics of the terminator at the end? Glad I could help guys. thereandblogagain: It's funny you mention the unsupported tabard, that's the problem I had and how I ended up with this solution. 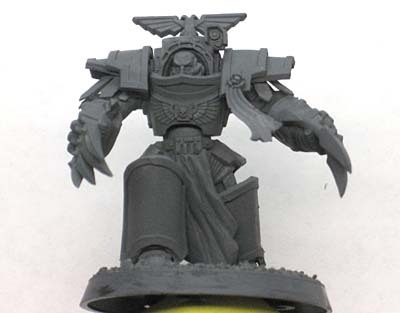 C Truddedn: The terminator at the end is my Pre-Heresy Deathwing Belial. I've got a post about him right here. Agis: No prob, hope it works out for you. What about the reverse side, where you can still see the card? Do you sculpt the reverse too? Thanks! Anon: Good question. The answer is no. I don't do anything with it at all other than to paint it the shadowed color so it is "hidden" so to say. 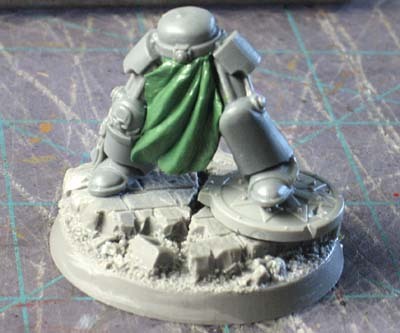 On most models the back of the tabard is near impossible to see without picking the model up and looking under it. 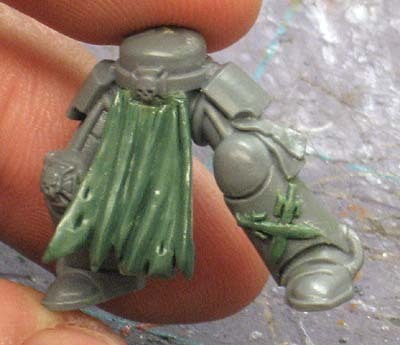 If I had a model where the tabard was flowing in one direction or was situated on a model in such a way that you could see both sides relatively easily, I'd certainly sculpt what could be seen to carry the illusion.